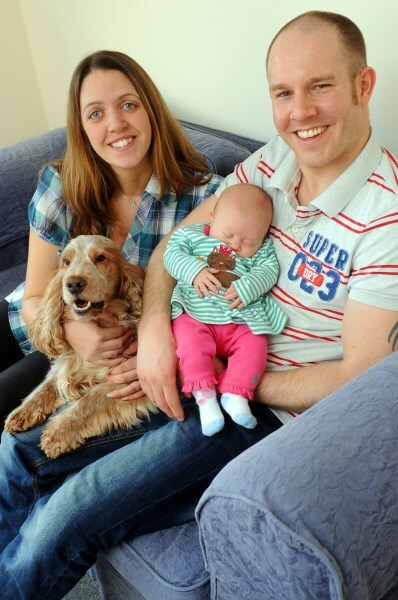 It's a big moving day as Felpham couple celebrate new home and new arrival! 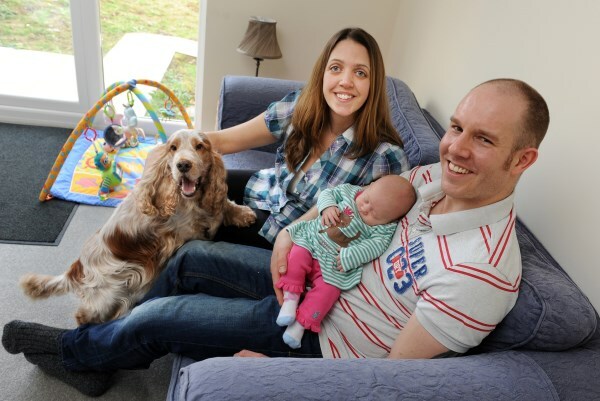 Felpham couple Karl and Alice Stevens were not the only new arrivals when they stepped up the property ladder and moved into their brand new Bovis Home at Milton Place. The couple had bought their three bedroom semi-detached home using the house builder's own part exchange scheme called 'Home Exchange' and were excitedly travelling between their old apartment and their new three-bed home on moving day. But as Karl unpacked at the new house and Alice was locking up the old property, she went into labour - and after a rush to hospital, baby Poppy was born later that day. While news about this drama spread, friends and family rallied around and set about unpacking their possessions at the new house and assembling beds and nursery equipment. Alice said: "It was such a nice surprise when we came home from the hospital. We were expecting most things to still be boxed up and in the garage or lounge, but they had done so much to help. It was really lovely." With Home Exchange, Bovis Homes buys the customers' old property to enable them to purchase a brand new home in a quick and easy move, avoiding estate agent's fees and house chains. Karl, a supermarket store deputy manager, and Alice, a groom at a local stable, previously lived in a two bedroom flat, so with the imminent arrival of their first child, they were looking for a house with at least two bedrooms and a garden. However, thanks to Home exchange they actually ended up with a lot more than they bargained for! Alice explains: "Our new house is more than we thought we could afford, with a large third bedroom, garage and off-road parking. The garden was a must, not only for Poppy but also for our little dog, Custard." The location of the house was also a big incentive. Alice said: "Felpham is a lovely, quiet area. We previously lived in Littlehampton, only ten minutes away, and we loved the area but our flat was on the ground floor on the corner of a busy road. The move to the new house also reduces my commute to work by around 15 minutes, which is great and another huge plus of the street we have moved into is that all of our new neighbours are fantastic!" The couple had seen a few properties in their home search of the area, but none that matched up to their new Bovis Home. "I remembered driving past Milton Place previously and liking the look of it. We booked an appointment and met the sales advisor, Malcolm, who showed us around a couple of houses that were nearly finished and also some plans for future homes, as well as telling us about Home Exchange, so we decided to see what it could offer us. "Our flat had been on the market for six months but Bovis Homes offered us the full asking price and then this home became available, so we decided to go for it. Then it all happened very quickly, which was great for us with Poppy's arrival getting closer. "We can't praise Malcolm and Dean, from the site team, highly enough. They are both always willing to answer any questions we have and sort out any slight issues very quickly. Whenever we bump into either of them around Milton Place they are always very friendly and never too busy to chat." Alice added: "It was such a straightforward, speedy process with Bovis Homes, which we were really thankful for. We're enjoying life together in our gorgeous new home, and with our new family; it's perfect."